Maui Whale Watching Tours: My Top Picks and More! My Top Picks for 2015! If you're interested in Maui whale watching tours, you'll soon realize that there are TONS of companies to choose from. To save you the time of researching all of them, I've narrowed down the list to my TOP PICKS! I've included links to individual Maui whale watching tours on the Barefoot Tours site where you can find out more about pricing, reservations and tour times. 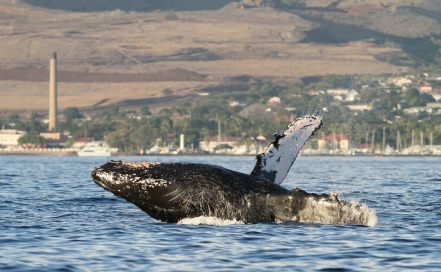 Captain Steve's Early Bird Departure looks like a great option for whale watching in Maui! They have a great price, good reviews, hydrophones included and whale sightings are guaranteed during whale season! I like the fact that they've been in business for over 20 years too! This type of boat is BY FAR my favourite! I love the exhilarating feeling of adventure that comes with riding in a low-lying boat speeding across the open ocean! I love the cool spray from the waves, and, best of all, the chance to get REALLY up close and personal with whales and dolphins! When whale watching in Maui, boats are not permitted to approach too close to the whales on purpose. But if a whale approaches the boat on their own, passengers can get the amazing experience of a really close encounter with these amazing creatures! Just how close can might you get to some of the larger marine life when whale watching in Maui? Well, on our last trip on one of these types of boats, we ended up being completely surrounded by dolphins... they were so close that I literally could have reached out and touched them - it was an experience I will never forget! Both of my top picks for Maui whale watching tours on a catamaran have a rating of "A" with the Hawaii Better Business Bureau and generally get good reviews from other travelers. They are also smaller catamarans, so you won't be competing for a view of the whales with 149 passengers like on some of the larger vessels out there. 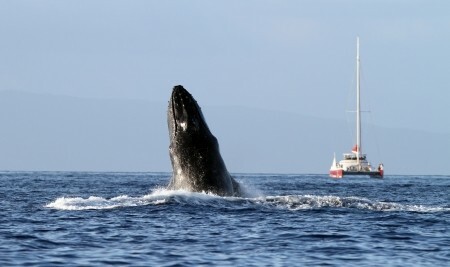 To go whale watching in Maui from the south side of the island, I recommend Aloha Blue Charters. They operate a smaller 30 passenger catamaran for their Maui whale watching tours, which departs from Maalaea Harbour. There is a naturalist aboard for all of their trips, which is great if you want to not only SEE the whales, but learn more about them too! Many of their vessels are larger than Trilogy's. However, I can tell you that more people on a larger vessel does NOT equate with more crowded in this case - I found the views were excellent, and it did not feel cramped at all. Since there weren't a whole lot of options for whale watching in Maui on boats such as sailboats and small yachts, the easiest way to find one is to just browse through the listings here. Still want to see all of the other options for whale watching in Maui? No worries! Here is a short summary for each of the other tour operators. The Pacific Whale Foundation is a well regarded company that definitely knows their way around whale watching in Maui! Their pricing is decent, their large, catamaran-style boats are generally considered suitable even for small children, they have hydrophones on their boats (to allow you to LISTEN to the whales! ), and they have naturalists on board if you want to learn more about the whales! Because I've heard a lot of good things about them, I wanted to devote a bit more space to going over their various Maui whale watching tours! 1) Sunset Cocktail Cruise and Maui Whale Watching Tours all in one! I like this idea because it combines 2 of my favourite things to do in Maui: whale watching and a Maui sunset cruise! This combo can saved you the money you would have spent on a separate whale watch tour! I recommend you book your sunset cruise for whale watching in Maui early on in your vacation - that way, if worst case you don't see any whales, you'll still have time to book a separate guaranteed whale sighting tour for later in your stay. **Before you book, ask Barefoot Tours if you'll get a free regular whale watch in the unlikely event that you're unlucky and don't see any whales! Whale Song Full Moon Cruise: As the name implies, this tour is only available during a full moon. This is another 2 hour sunset cocktail cruise doubling as a whale watch. Appetizers and beverages are included. What makes this outing extra special is that an astronomer will be on board to share some great stories about the moon and space! Although we haven't been one of the Pacific Whale Foundation Maui whale watching tours, we DID go on one of their Maui sunset cocktail cruises. We had a blast, and even though it was only appetizers being served, there were enough of them that we were able to make a supper out of it! If I end up going on another sunset cocktail cruise and it's whale season, I'll for sure be looking into whale watching in Maui on a sunset cruise! And if I happen to luck out and be there during a full moon for their Whale Song Full Moon Cruise, all the better! 2) Whale Watching in Maui and Whale Education ULTIMATE combo! Ultimate Whale Watch: **ADULTS ONLY** 3-4 hours in total. The first 25 minutes is spent "in the classroom" with a Pacific Whale Foundation researcher where participants will learn about researching and photographing whales in the wild over a continental breakfast. The next 2 hours will be spent on their catamaran whale watching. The outing ends with a nice recap in their research lab! Lahaina Whale Watch Special: This is the same as the the regular Lahaina Whale Watch except for the fact that there is a nice discount on adult tickets ($10 at the time of this writing) and it is only available as I write this with departure times of 6:30 a.m. or 2:30 p.m.
Captain Steve's Rafting: Their 2 hour Maui whale watching tours depart from Mala Wharf in Lahaina. WHALE SIGHTINGS GUARANTEED during whale season. Captain Steve's Maui whale watching tours are not recommended for pregnant women, people with bad backs, those who had recent surgery or kids under five years old. Maximum 30 passengers. Hydrophones are included. There's also an "Early Bird" 7:30 a.m. departure that will save you $8 per adult (price is current at the time of this writing). Hawaii Ocean Rafting: 2 hour whale watch departing from Lahaina Harbour. Hydrophones included. Whale watching in Maui with Hawaii Ocean Rafting is not recommended for pregnant women, people with back problems, or children under 6. Maximum 14 passengers. Ultimate Rafting Maui: A 1.5 hour tour departing from Lahaina Harbour. Certified Marine Naturalist onboard. Maximum 18 passengers. No pregnant women, bad backs, or recent surgery. Children under 6 not recommended. The Early Bird Tour is less expensive. Gemini: Their 2 hour Maui whale watching tours depart in late afternoon from Kaanapali Beach, in front of the Westin Maui. A bit pricier, but appetizers/beverages included. Maximum 49 passengers. Narration by a naturalist and hydrophones included. Underwater viewing ports. There is also a less expensive early morning departure with a continental breakfast in lieu of appetizers. Passengers get on the boat right from the beach, so be prepared to get wet up to your knees when boarding! Teralani: A 2 hour AM outing departing from Kaanapali Beach (a.k.a. "Dig Me Beach.") Maximum 49 passengers. Continental breakfast included. Onboard naturalist and hydrophones. January 1 - March 31 guaranteed whale sightings. Alternatively, you can save about $10 per adult and go on either their afternoon whale watch or early morning excursion. Trilogy: A 2 hour outing, departing from Maalaea harbour. The boats used for the Maalaea departure take up to 54 passengers. Hydrophones are included. 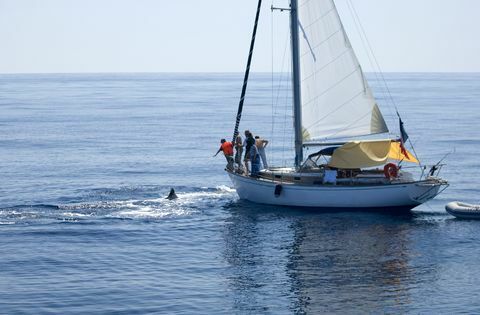 Whale Watching in Maui on Sailboats, Yachts and More! Maui Diamond II: A 2 hour afternoon whale watch departing from Maalaea Harbour. Maximum 18 passengers. A whale naturalist will be on board. The Scotch Mist: A 2 hour outing departing from Lahaina Harbour. Maximum 18 passengers. Beverages, including beer and wine are included. The Scotch Mist is a 50 foot sailing yacht. Hydrophones are included when whale watching in Maui on board The Scotch Mist. Wailea Boating Company: A 2 hour minimum outing departing from the Kihei Boat Ramp. Maximum 6 passengers. Fishing gear, snorkel equipment and hydrophones included. Wake Maui: A 2 hour outing departing from Kaanapali Beach (a.k.a. Dig Me Beach). Maximum 6 passengers. 1) Make your whale watch unforgettable with by top tips for whale watching in Maui! 2) We had some amazing whale and dolphin sightings on our daytrip from Maui to the island of Lanai. Click here to read all about it and check out our pics! 3) Want some adventure? Here are our Top 10 Things to do in Maui for Adventure! 4) Need more ideas for fun things to do on Maui to relax? Check out our top things to do on Maui for that!